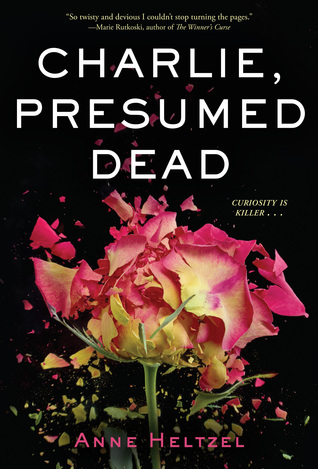 From Goodreads ~ In Paris, family and friends gather to mourn the tragic passing of Charlie Price - young, handsome, charming, a world-traveler - who is presumed dead after an explosion. Authorities find only a bloodied jacket, ID’d as Charlie’s. At the funeral, two teens who are perfect strangers, Lena Whitney and Aubrey Boroughs, make another shocking discovery: they have both been dating Charlie, both think Charlie loved them and them alone, and there is a lot they didn’t know about their boyfriend. Over the next week, a mind-bending trip unfolds: first in London - then in Mumbai, Kerala, and Bangkok, the girls go in search of Charlie. Is he still alive? What did their love for him even mean? The truth is out there but soon it becomes clear that the girls are harboring secrets of their own. Unbeknownst to each other, Aubrey and Lena had been dating Charlie ... Aubrey for a year and Lena for three years. They discover each other at Charlie's funeral. A plane he was flying crashed and all that was found of Charlie was his bloody jacket and he is presumed dead. Lena can't believe that Charlie is dead so convinces Audrey to travel to Mumbai and Bangkok looking for him. Along the way, they pick up clues that he may indeed be alive. This is the first book I read by this author and I have to say I wasn't all that crazy about it. I thought it was an interesting premise but it fell short for me. The book is written in first person perspective from Aubrey and and Lena's point of view and second person perspective from Charlie's point of view ... the chapters alternate and you know who the focus is because of the chapter headings. In the first part of the book, both Aubrey and Lena kept referring to their secrets, which was awkwardly handled ... like "Oh, I hope Lena doesn't find out my secret" but it wasn't revealed at that time. It was probably done to build some suspense for the reader but I found it annoying. I found some of their interactions farfetched. As a head's up, there is swearing. Audrey and Lena are both in their late teens (Aubrey has just finished high school and Lena is in university). Lena comes from money and has no problem footing the bill as they travel from Paris to London to India, etc. They started off as strangers thrust together because of Charlie's infidelity and the possibility that he may be alive. I didn't find either of them likable. I know they were young but some of the decisions they made were dumb. Charlie sounded like a jerk or a nut and I found it hard to believe he was able to be as manipulative as he was. I thought the ending was lame and disappointing. After investing the time into reading the book, my response was "Huh? That's it? That's how it ends?"